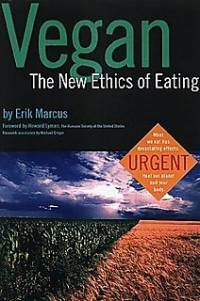 Hard-hitting and factually based, this book outlines the health, ethical, and ecological reasons for adopting a vegan lifestyle. The author outlines many practical reasons for making this conscious choice- among them is that 70% of all Americans are dying from illnesses related to diet. As heart disease is one of the leading killers, the author suggests a link between animal protein consumption and heart disease. He also gives extensive documentation of cruelty to the animal population by visiting several slaughterhouses and animal farms. The author's writing style appeals to the reader's compassion. It seems at times to be almost political in its agenda. Change your eating habits and become a better person is the final message I am left holding onto at the end of the book. Whether you consider the author's suggestions to be radical or rational, he speaks from personal experience. As noted in the foreword of the book by Howard Lyman, he felt an awakening to the concept of eating vegan when he was lying in a hospital bed. He felt that he could no longer ignore the killing on his family's farm and had to make a lifestyle change. He has the support of many in the medical fields, including Dr. Dean Ornish, care-giver to many celebrities and high-profile public figures and leading author of NY Times Bestselling books, Eat More, Weigh Less and Dr. Dean Ornish's Program for Reversing Heart Disease. Ornish suggests that healing qualities exist with a combination of vegetarianism and meditation, and was the first in his field to present findings suggesting that heart disease can be reversed through diet and lifestyle changes, free of surgery and drugs. Four new food groups are introduced, excluding the meat group. He suggests that protein, calcium, as well as other nutritionally essential elements in a person's diet can be met without the addition of animal food products. While this book is educational, it lacks recipes to show how tantalizing food can be without the addition of meat. However, the lengthy resource list at the end of the book suggests much research and achieves the objective of retraining the reader to think before eating. - From Independent Publisher. This text refers to an out of print or unavailable edition of this title.